I see superstitious behaviour everywhere. I see the obvious ones, of course, but I see it lurking behind established Jewish rituals as well. Take the ritual of the bride circling the groom at the chuppah. The 15th century kabbalist, Menahem Tziyyuni ben Meir of Speyer, in discussing the use of circles as a magical device said, “Those who invoke demons draw circles around themselves because the spirits have not the power to trespass from the public to a private area.” This is most likely not the reason you have ever heard given at a wedding. As my beloved Talmud professor, Dr. P, suggested, no one wants to hear about demons at a wedding. And so there are many lovely and meaningful interpretations used to introduce the notion of circling. In all likelihood, thought, the origins of the act lie with the desire to protect the bridal couple at such a vulnerable time. For demons are known to flock to celebrations in order to do their mischief. I could go on and on…because, as I said, I see superstitious behaviours skulking about the place. Usually, however, the superstitious origins remain carefully concealed behind fluffier explanations. And, by the way, the fact that so many of our rituals derive their origins from folkloric beliefs in no way lessen their authenticity as Jewish rituals. Most religions include rites that were reappropriated from its host culture(s) and Judaism is no different. There is a tradition that at the conclusion of the burial service at a Jewish funeral, the mourners leave the cemetery walking between two parallel lines formed by those in attendance. 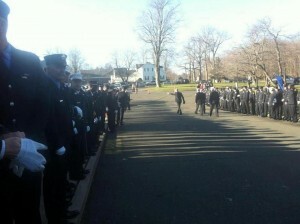 As the mourners pass between the two lines, they are greeted, for the first time, with words of comfort. This tradition is first mentioned in the Talmud (Sanhedrin 19a) though no reason for the practice is given. Every explanation I have heard or read mentions the transition from honouring the dead to consoling the bereaved or a message of future comfort. Meaningful explanations in a time of grief. But seeing these police officers and fire fighters line the path for the mourners of one of the Sandy Hook victims caused me to pause. Interesting post. I’ve never considered myself superstitious, although I suppose there are some things that could be considered as such, like wishing at 11:11. My mind went to the exact same place! I love talking about the demons around us, as you know. That section of Talmud in the 10th chapter of Pesahim, where two rabbis are walking home at twilight (neither day nor night=liminal, vulnerable time) and pretending they are three people because demons are deterred by odd numbers, is one of my favorites. Amen…..and may the Westboro Baptist Church be the evil that unites communities, christians and jews…..may their attempts to inflict their cruel, evil and self serving ways only serve to strengthen our belief in God and one another….. May the mourners walk protected between the lines, and may God bless and save us ALL. There is merit in some superstitions for no reason other than the solace and comfort they can provide.